The iHeartRadio palette consists of three colors: iHeartRadio red, black, and white. The red, used in our logo, is the core of our brand identity and appears whenever possible for users to immediately identify the brand. 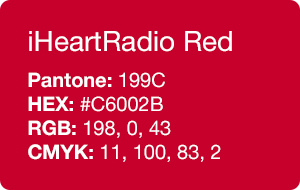 The iHeartRadio red is used to identify our brand, usually in the header on mobile. Otherwise it is used sparingly for highlights and calls to action. Light grays are used for supporting text, dividers, and secondary buttons. Dark grays are used for primary text and selected states. Our blue is used for buttons, modals and coach marks. iHeartRadio for Home is designed to be on a dark background. We use black, white and gray for type and UI elements. Whites or device specific shadows are used for highlight states. Transparent blacks are used on top of photography. Use accents of white in its icons and text, delicately in contrast to engaging album art. The iHeartRadio red is used sparingly on Web. 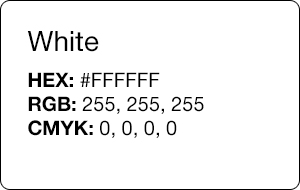 Transparent blacks with white type are used as alternatives to black on white. Light grays are used for dividers and sub-navigation to separate content. 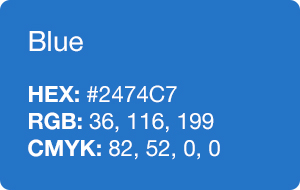 Occasionally for a button style that needs more gravity, we use blue (#2474c7). Like mobile, Auto uses the red header when possible. It can have two different usages of color depending on the time of day. At night, the colors tend to use a darker palette, like Home Entertainment. This is to not distract from driving. Unique to Auto, there also exists a smartphone app, called Solid User Interface (SUI) that can be used to control wirelessly the built in dashboard interface of the car. Otherwise the design may be heavily determined by the car manufacturer.